Once again Dr. Edward Force, America's foremost authority on miniature vehicles shares his knowledge with other avid collectors. This time he turns to Italy, where diecast miniature vehicles began to be manufactured after the end of World War II. Mercury built their first models in 1945, followed by Lima, Nigam, PM, Ra-Ro, Rivarossi, Safar and SVP. 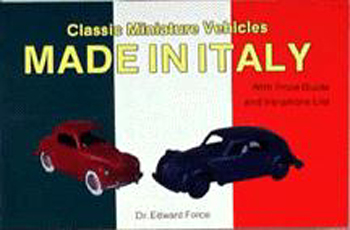 Cars from these and other Italian companies are presented in full color with informative, vital facts about the cars presented in an easy to use format.This new volume has more models to list than any of Ed Force's previous works, making it a jam-packed, interesting, important reference. This is an important book for the libraries of all serious miniature car collectors.